Let us scan your old documents and files taking up valuable and expensive office space and save them onto any storage device such as CD, USB, hard drive or we can upload to your internal FTP site. Any size document from the smallest receipt up to an A0 sized map can be scanned to any file format such as pdf, jpeg or tiff. Black and white or full colour, the choice is yours. We will work with you to name and index your documents before the scanning is started. This will enable easy and speedy retrieval of data which can then be printed, emailed or just viewed. We can also add certain features to your scanned documents such as password protection for extra security, pagination or make them searchable. 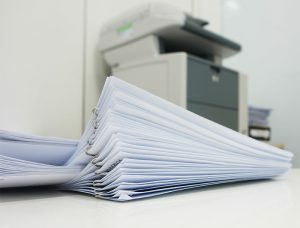 Optical Character Recognition (OCR), a technique that converts scanned paper documents into files that can be saved to a format of your choice then edited. Maybe an amendment needs to be made to a lease and will take an age to retype. We can scan the lease and email it back to you in your desired format for you to edit. OCR also enables the documents to be text searchable. Being able to search for a specific address, date, name or reference for example will speed up the search for certain data. Large volumes of paper documents can be scanned to pdf and saved to a cd or dvd. This will auto run once placed into a pc or laptop and an index page will load which can then be linked to the corresponding documents.